006 brought a number of developments in the Energy Department’s Yucca Mountain Project. The most important events included the announcement of an updated timeline for the project, the revival of a study of a new route for rail transport of nuclear waste through Nevada, and the confirmation of a new director of the Office of Civilian Radioactive Waste Management (OCRWM). The following is a review of these and other Yucca Mountain-related events of 2006. The Department of Energy (DOE) announced in July of 2006 that it had set a new target date for the opening of the proposed repository. Under the new schedule, the Yucca Mountain repository will be ready to start accepting shipments of nuclear waste in March of 2017. DOE had previously projected that the repository would be operational by 2010. That deadline was abandoned two years ago due to budget shortfalls and various scientific and regulatory obstacles. This new schedule assumes the successful resolution of a number of political, financial, and legal issues that have stymied the project. For instance, in order to meet the 2017 deadline, DOE must submit an application to build and operate a repository to the Nuclear Regulatory Commission (NRC) by June of 2008. 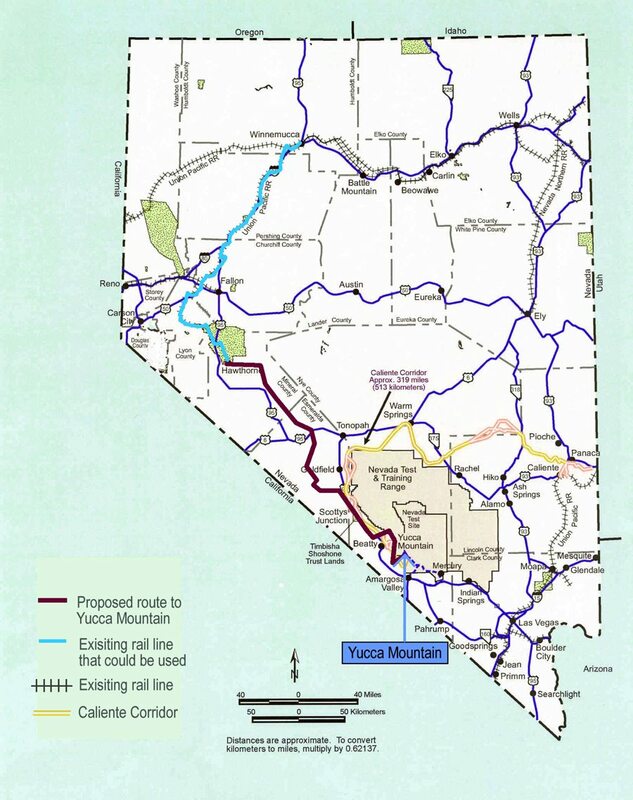 According to this timeline, DOE anticipates that the construction of a rail line in Nevada would begin in 2009 and be completed by June of 2014. DOE announced in October of 2006 that it plans to prepare a supplement to its final environmental impact statement (EIS) for the proposed Yucca Mountain repository. This announcement follows the Energy Department’s plans, first revealed in October of 2005, to shift the design of the repository in order to improve safety and performance. This new “clean” design calls for nuclear waste to be delivered to the repository in standard canisters that would not require substantial onsite handling prior to being placed in a waste package for disposal. The new plan eliminates the need for huge, costly surface facilities for repackaging the nuclear waste. The waste will instead be packaged at commercial sites in multipurpose transport, aging and disposal canisters (TADs). In fall of 2006, DOE invited the public to comment on the scope of the supplemental Yucca Mountain EIS. DOE held public hearings and accepted public comments in written form between October 13 and December 12. In May of 2006 DOE made a decision to reopen consideration of the so-called Mina rail route. This decision followed a reversal of opinion by the Walker River Paiute Tribe, which had previously been opposed to the shipment of high-level nuclear waste through its reservation. 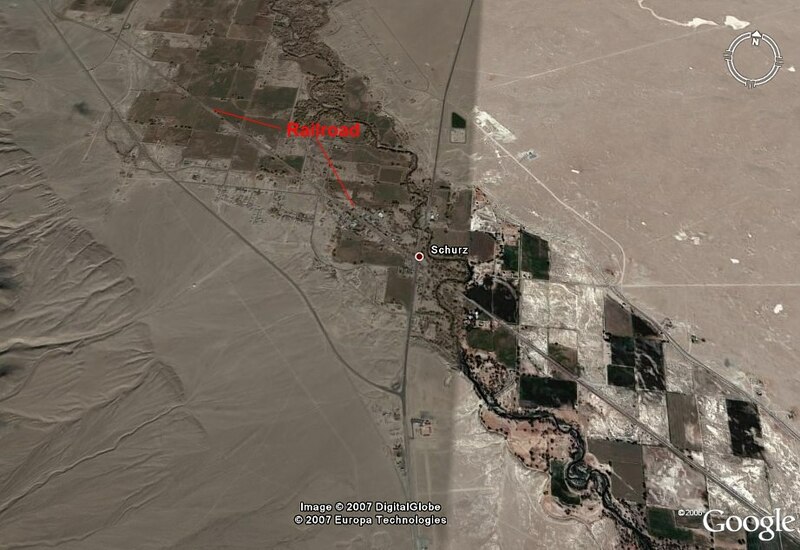 The route in question would cut through the Walker River Indian Reservation north of Hawthorne. DOE previously named the Caliente route as its preferred corridor for a rail route to Yucca Mountain. The cost for constructing the Caliente route is estimated at almost $2 billion. Some transportation experts believe that the Mina route would be faster and less expensive to construct than the Caliente option. In October 2006, the Energy Department announced that it would prepare a supplemental environmental impact statement for the Mina Route. Public scoping hearings were held in October and November to gather comments regarding the proposed Mina route. According to DOE, work will also continue on the environmental assessment of the Caliente corridor. The two assessments are due to be completed in the summer of 2007. The U.S. Senate confirmed Edward “Ward” Sproat to direct DOE’s Office of Civilian Radioactive Waste Management in May of 2006. Formally a nuclear industry executive, Sproat is the sixth director to lead the Yucca Mountain program since its inception in 1983. Sproat’s goals for his tenure as OCRWM director include submitting a license application for the repository by June of 2008, designing and staffing OCRWM to more effectively manage the Yucca Mountain project, and developing and implementing a national nuclear waste transportation plan that accommodates state and local concerns to the greatest extent practicable. “Fix Yucca” legislation was introduced in the U.S. House and Senate during the 2006 session. This bill was aimed at upping repository capacity and speeding up the licensing process. The bill stalled in committee and was not voted on in 2006 (Las Vegas Review- Journal, 6/28/06). Senator Pete Domenici (R-N.M.) introduced the Nuclear Waste Acceleration to Yucca bill in September which would have paved the way for interim storage of nuclear waste at Yucca Mountain. The bill did not make it to the Senate floor before the end of the 2006 session (Las Vegas Review-Journal,9/28/06). Senator Harry Reid (D-Nev.) as the 2007 Senate majority leader, said bills to allow nuclear waste to be sent to Nevada on an early schedule, or would speed land withdrawals, permits and licenses, would never would see the Senate floor. (Las Vegas Review- Journal, 11/9/06). In September of 2006, a panel of federal judges dismissed a Yucca Mountain lawsuit filed by the State of Nevada. The lawsuit sought to force the Nuclear Regulatory Commission (NRC) to change a waste confidence rule, which Nevada claimed would bias the NRC in favor of approving the repository. The suit was dismissed on technical grounds (Las Vegas Review-Journal 9/28/06). In August a U.S. Court of Appeals panel declined hear a Nevada lawsuit charging DOE with violating federal law when it formed its nuclear waste transportation strategy for Yucca Mountain. The court reasoned that it was premature for the state to challenge DOE’s rail transportation plans. Nevada officials chose not to appeal the court’s ruling (Las Vegas Review-Journal, 8/9/06). Investigators decided not to file criminal charges in the 2005 Yucca Mountain e-mail scandal. The emails, written by U.S.G.S. employees, indicated that quality assurance documents may have been falsified. Investigators failed, however, to uncover conclusive evidence of criminal actions (Las Vegas Review Journal, 5/05/06). According to an October federal court ruling, the federal government must pay $143 million to the owners of three closed nuclear power plants due to its failure to begin accepting the plants’ spent nuclear fuel. The utilities successfully argued that the government had broken its contractual agreement to begin taking the nuclear waste by 1998. Similar suits by other nuclear utilities are expected to follow (Hemscott News, 10/4/06). DOE decided in 2006 to reopen its study of the so-called Mina rail route to Yucca Mountain. This decision follows a reversal of opposition by the Walker River Paiute Tribe, which had originally maintained that it would not allow shipment of nuclear waste through its reservation. DOE has announced plans to prepare a supplemental environmental impact statement to assess the suitability of the route (Las Vegas Review-Journal, 10/12/06). The Environmental Protection Agency (EPA) indicated that it expects to finalize its Yucca Mountain radiation standard by the end of 2006. A U.S. District Court overturned the agency’s original radiation standard in 2004. The EPA released a reformulated standard in August of 2005. Once this new standard is finalized, the NRC will determine whether it is sufficient to protect public health and safety (Las Vegas Review-Journal, 5/6/06). …. The Department of Energy (DOE) held hearings in various Nevada locations in order to inform the public about the upcoming study of the so-called Mina route and collect public comments on the matter. Hearings held in Hawthorne and Goldfield were well attended, with a majority of the participants expressing support for the Mina route. While some were opposed to the rail line, many expressed hope that the project would bring prosperity to this part of rural Nevada. Environmental impact statements for the Mina and Caliente rail line options are expected to be completed by summer of 2007. DOE does not anticipate that it will make a final decision on construction of a rail line through Nevada before 2008 (Las Vegas Review-Journal, 11/15/06). Ward Sproat, head of the Energy Department’s Office of Civilian Radioactive Waste Management (OCRWM), stated that the project suffers from a “quality problem” that must be fixed before the licensing process for the proposed repository begins. Sproat delivered his assessment to the Nuclear Regulatory Commission in September. John Arthur III, 53, deputy director of the Department of Energy’s Yucca Mountain Project in Las Vegas, died on December 26, 2006, of cancer. John’s 27 year career as a public servant for DOE included managing operations for the nation's largest environmental cleanup and nuclear materials management programs. He represented DOE at Affected Units of Government meetings and strived for a constructive working relationship with the counties. He was admired for his down to earth and positive approach to life. He is survived by his wife and two children.